All transactions are safe and secure with a reliable history in online purchasing behind each of our associates. 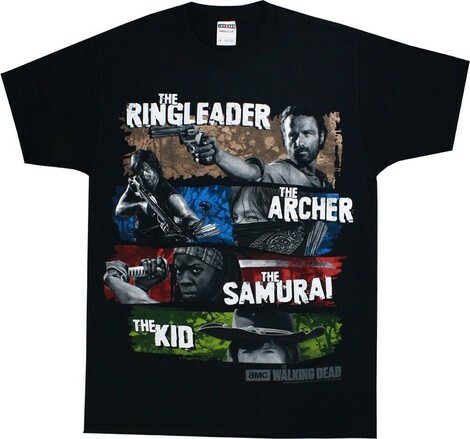 Buy the Ringleader, Archer, Samurai & the Kid Walking Dead t-shirt to own Walking Dead clothing and merchandise. Get ready to take out zombies in one of these spaghetti western inspired AMC Walking Dead t-shirts. This bestselling design features Rick Grimes (Andrew Lincoln), Daryl Dixon, Michonne and Carl. It was inspired by the Clint Eastwood western The Good, the Bad and the Ugly. Be sure to check out the Walking Dead costumes and other merchandise in the gallery. Fans love it all, so grab a comic tee for a friend as a pleasant present. Everything is to die for...so to speak. In addition to the Ringleader, Archer, Samurai & the Kid Walking Dead tee above, browse the Walking Dead Clothing Gallery for more apparel like men's and women's clothes, kids shirts or hoodies.